New hotel near Myeogdong and Jongno area, opened in 2012! 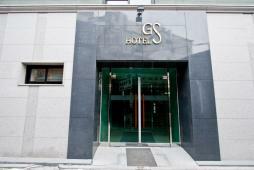 GS Hotel is a brand new hotel just opened in Jan. 2012, located in Jongno area, where many restaurants gather. Wide entrance, front lobby and hallways welcome guests with large luggage. There 29 rooms with a selection of double, twin, triple and executive rooms. Rooms are furnished with warm color interior and large bed eases tired travelers. Rooms are equipped with tea set, PC with internet connection, A/C and wide screen TV. Shampoo, conditioner toothbrush etc are sold for 1000KRW at the front desk. Complimentary breakfast including serials, bread, milk, coffee and fruits is served beside the front lobby. Though the building is smoke-free, guests can visit a cafeteria at 3F to smoke. The hotel is within a walking distance to Myeongdong, Jongno, Insadon and Chunmuro area. The access to Apgujeong or Sinsa is also convenient as Jongno 3-ga station (subway line 1, 3 and 5) is nearby.